On the road – Own Less. Do More. There are 83 posts filed in On the road (this is page 1 of 17). Born to run? You’d have thought so, but no. It was harder than that. I yanked up my big-girl leggings and learned how to do not one, but two exciting new things this year — things I have said out loud, and multiple times, that I’d never do. Backpacking was one of them, and that one’s my husband’s fault. The other? At age 49, I’m a runner now too! Which means I am my father’s daughter after all. I like my big-girl leggings loud. These literally give me rosy cheeks. And it wasn’t easy. When I started back in January of this year, I struggled to run for even 5 minutes at a time, then I’d have to walk for 10-15. So I’d wrap myself in my blanket of excuses, and then give up for another year or so before trying it again. Paradoxically, my father’s been an avid runner for as long as I can remember. Boston Marathon, Marine Corps Marathon, other full and half marathons, and all the K’s — dozens, if not hundreds of road races. Quite honestly, I thought running ability was my birthright, so another piece in my Puzzle of Frustration was that it did not come naturally to me. At all. My brother can do it, and so can his kids. But clearly, I didn’t get the gene. So I tried again this year, and y’all? I got it to stick this time. Longer than ever! Nine months later, I’m running 3-6 miles, about 3 times/week. Weight. I started 10-20 lbs lighter than any other time I’d tried to take up running, and that made it much less stressful on my joints. Less pain, more gain. Goals. All I wanted was to be able to make running a regular and enjoyable part of my fitness regimen, at distances and durations that did not leave me feeling like I might die before noon. In other words, I really don’t need to act like I’m training for a marathon. Motivation. Since my breast cancer diagnosis in December of 2013, I’ve been a bit more stubborn than usual about finishing what I’ve started — or at least giving an effort my all until I realize that stopping might be a better option. Method: I chose not to follow a published training plan, but rather to follow my own body’s cues. Forgive myself and try again in two more days if I don’t achieve Item 1. Progress was slow, but I stayed with it, and after using my unconventional method for about two months, I could run 3 miles without stopping to walk. That’s when I signed up for my first race! It was just a 2.5 mile fun run, here in San Antonio back in March, but my daddy ran it with me, and we doubled back to finish the course with my mom, who’d walked it. Cancer has messed with our family more than once, so participating in Give Cancer The Boot felt pretty damn right. About that time, Tim started running with me. He’s been a runner before, and has a couple of half marathons under his belt, but his 2013 3-month hike on the Pacific Crest Trail did a number on his knees, and he’s been reluctant to run again. Luckily, my pace is slow enough that it rarely causes him any issues. We ran our first 5K together in April, in Mount Vernon, WA. Slug? Not nearly as cute. Hey, Utah. Your running trails are pretty. Can’t run under a rainbow without rain. The 40th Annual Rhody Run, in Port Townsend, WA, came with beer at the end! We ran the 6K (yes, six), and did not disgrace the family name. My first 10K was the Project Brave Pajama Run in San Antonio last month. Dad and Tim placed first in their age groups. (They were the only runners in their age groups. Shhhh.) And we got super hero cape cookies at the end! But I have not run so far or so long that I’ve had to duck behind a tree, dumpster, or other structure for a potty break, and I consider that a plus. It’s an exhilarating feeling to cross a finish line, no matter what my statistics say about my performance. *I’ve made it to 8. Once. Still working my way up to 10. 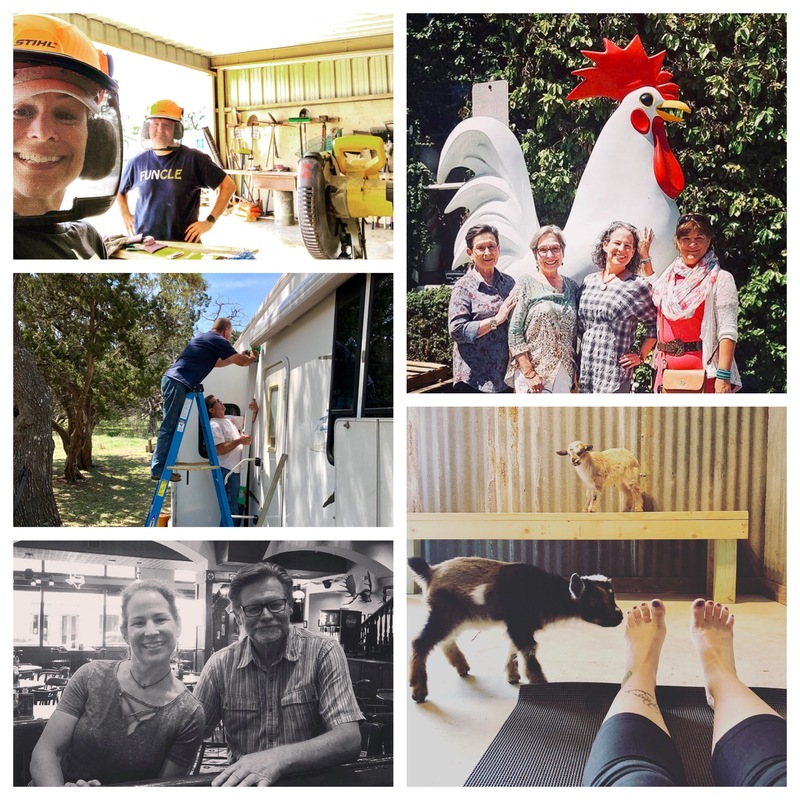 Everything’s bigger in Texas and it’s our home base and lots of people we love either visited or were already there — and that kind of explains why we spent the first three months of 2018 in the Lone Star State. Here’s a summary of our time there, mapped with a little help from Google. Links to prior updates appear at bottom of page. RV miles traveled this quarter: about 970, all in Texas. 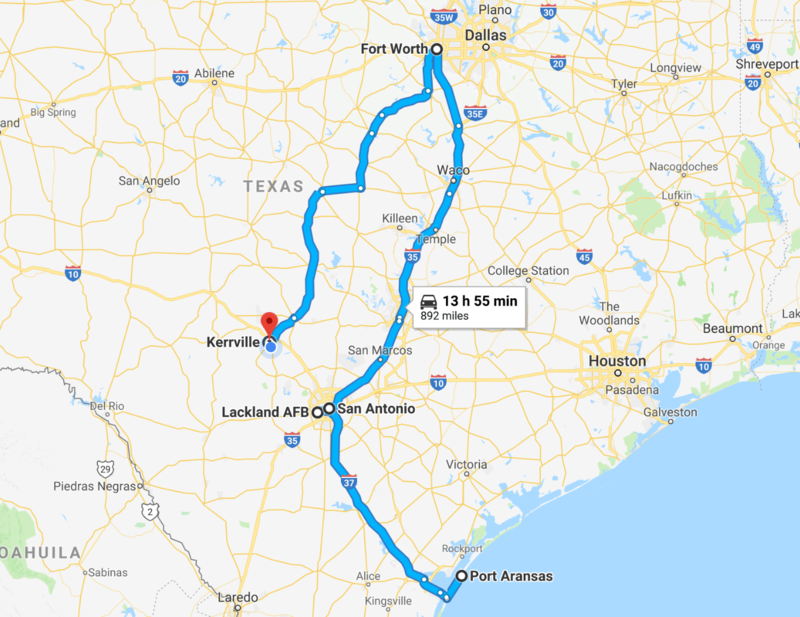 We went from San Antonio to Port Aransas, back to San Antonio, up to the Fort Worth area, and back down to Kerrville. Yes, our sons are very tall, and we are very not. Fed ’em well, I guess. 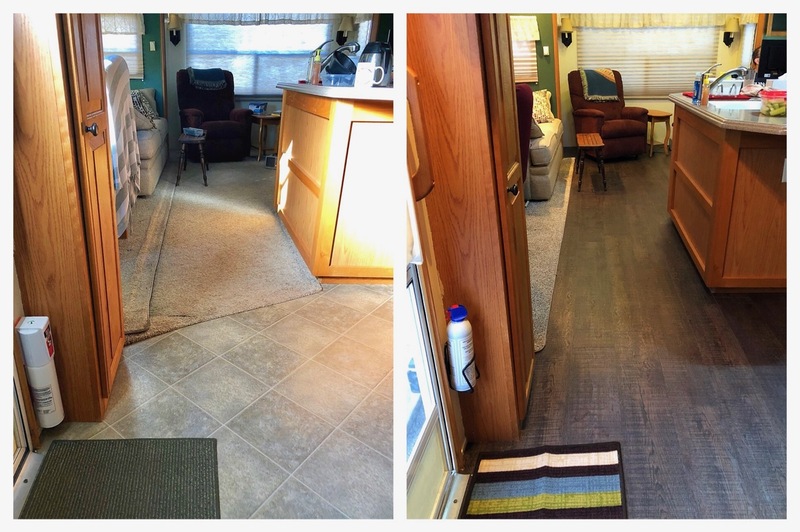 Fort Worth area, January 14-25: New flooring for the RV! I wrote a detailed post about that whole adventure here. In summary: The first round of vinyl planking looked good until it didn’t (the next day), so we had to extend our visit for a do-over. It was one of only a few RV repairs/upgrades for which we wrote a check instead of doing the work ourselves, and I think we’re still getting over it. Kerrville, January 25 – March 31: We did a little more work camping, this time alongside friends at Kerrville-Schreiner Park; upgraded from a cranky and complicated manual awning to an automatic one that works with the push of a single button; met fellow RV nomad, Peter, of Faith: the Final Frontier for a couple of beers; and reconnected with Lisa of Always on Liberty for an afternoon of shopping with my mom, her sister, and a bonus giant chicken. One of the best things I did was take a goat yoga class, and I’m pretty sure it offset the worst, which was going through the hassle of upgrading our driver’s licenses to show we’re qualified to drive this much rig. But both of us are official and legal now, and I only cried a few times. Sorry. There’s no photo of me throwing a hissy fit over having to take an actual driving test at the age of 49. But you can read about my unattractive meltdown here. Where are we now? We’re parked for a few days in Salt Lake City, on our journey from Texas (home of our younger son and my side of the family) to Washington (home of our older son and Tim’s side of the family). 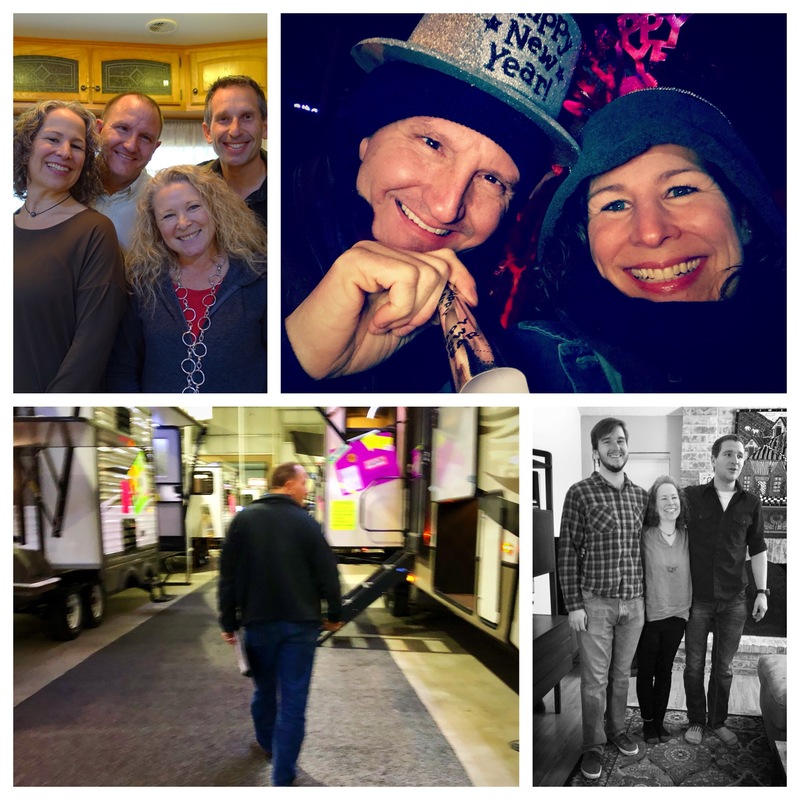 Follow us on Facebook, Instagram and/or Twitter for updates as we go!